If you follow my book blog The Writing Crafter, you’ll know that I recently had thyroid surgery and in recovering from that haven’t been doing much. I’ve barely read, most of my blog posts are drafts that I scheduled and wrote before my surgery, and most of what I’ve done has been playing video games and texting. At the moment, the only project I really have on the needles is the semi-circular scarf from my Alice In Wonderland collection, Frumious Bandersnatch, which is going great!! 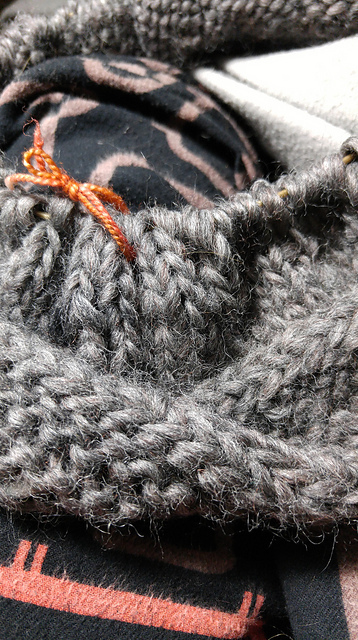 I love the yarn I’m using, Mill Ends from Stitch Studio by Nicole, and the lumpy, uneven texture of the yarn only serves to enhance the project itself. However, before I offer up the pattern, I’ll have to figure a way to make the starting point, the middle, lay flat, mine has an odd bump to it, which I can’t decide if its the yarn or a mistake I made. I don’t mind the bump, but some people who would want to use the pattern might. That’s actually the only pattern on my needles at the moment, surprisingly, because I’ve finished Twist and Slouch, and I haven’t yet started the scarf to match it, or the hat and gloves to match my Sea Witch Cowl. 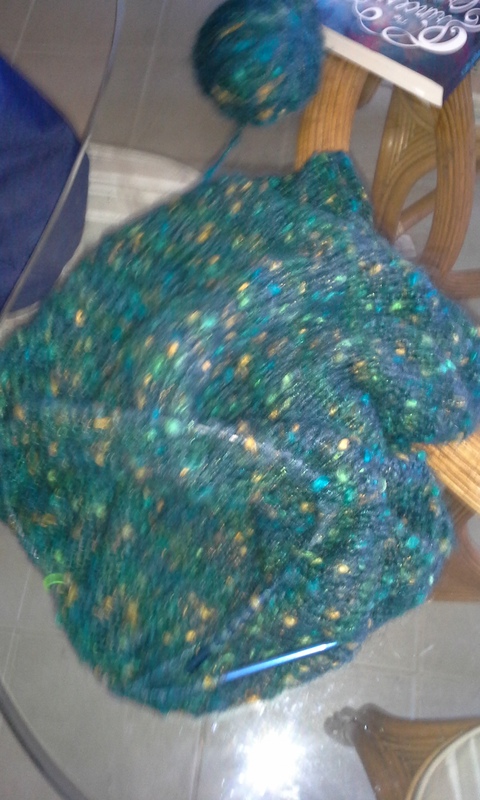 My first WIP is my Sea Witch Cowl, a pattern I made myself. I’m not certain if I’ll bother publishing it, because it’s very simple, but I may choose to because it is simple, and built for lumpy yarns which are sometimes difficult to find patterns for.